Well, I’m trying to get back to doing two manicures a week (one elaborate and one more simple). Moving threw things off quite a bit and mostly I end up doing the elaborate one because I don’t have the energy or time to do another one. Plus, y’know, the manicure starts simple and then I keep adding to it until it’s not. And then it’s a shame not to enjoy it for as long as possible since it took so much time. I think the programming term “feature creep” works here too. Sinful Colors was on sale and I fell completely in love with “V.I. Peach” from the Kylie Jenner Trend Matters collection. The combination of the clean peachy color and the glitter finish hits all my happy buttons. It does not have a great formula. You have to get it on the nail pretty quickly before it dries and I ended up painting three layers and still had some patchiness. Luckily nail stamping hides such sins with distracting patterns. I started by slathering “V.I. Peach” on half my nails and Sinful Colors’ “Exotic Green” on the other half with a smeary-sort of gradient on the middle finger. I didn’t even use a sponge, just dabbing it on with the brush and blending out with my finger (learned this from watching Robin Moses’ youtube videos). Then it was time for stamping! I bought a few of Born Pretty’s stamping polishes recently and hadn’t tried them out yet. They are actually the first real stamping polishes I have ever purchased even though I’ve been stamping for probably two years by now. 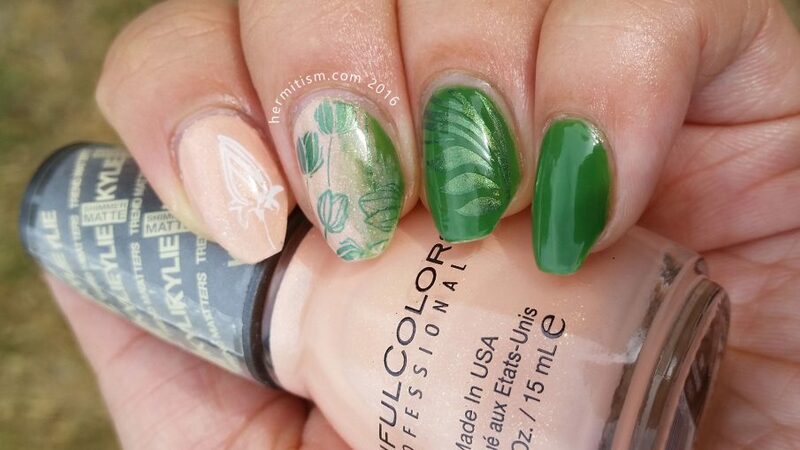 I used the white and greeny gold polishes with Born Pretty’s BP-L029 plate and Ejiubas’ EJB-02 plate to add some flowers and greenery. The only reverse stamping I did was to add a little bit of Sinful Colors’ “Cinderella” on the flower on my thumb to add a bit of contrast. In retrospect, I probably should have gone for one of my pinky jellies instead and used it to add a tiny bit of gradient to my thumb and index finger. They were a little too plain for my taste. In addition, the greeny-gold just looked green on my nails. The photos they use to advertise it definitely show it transitioning to gold so perhaps it needs a darker background or must be used with nail vinyls for the other color to show more. Ejiubas has pretty deep etchings so I don’t think it’s that. Still. 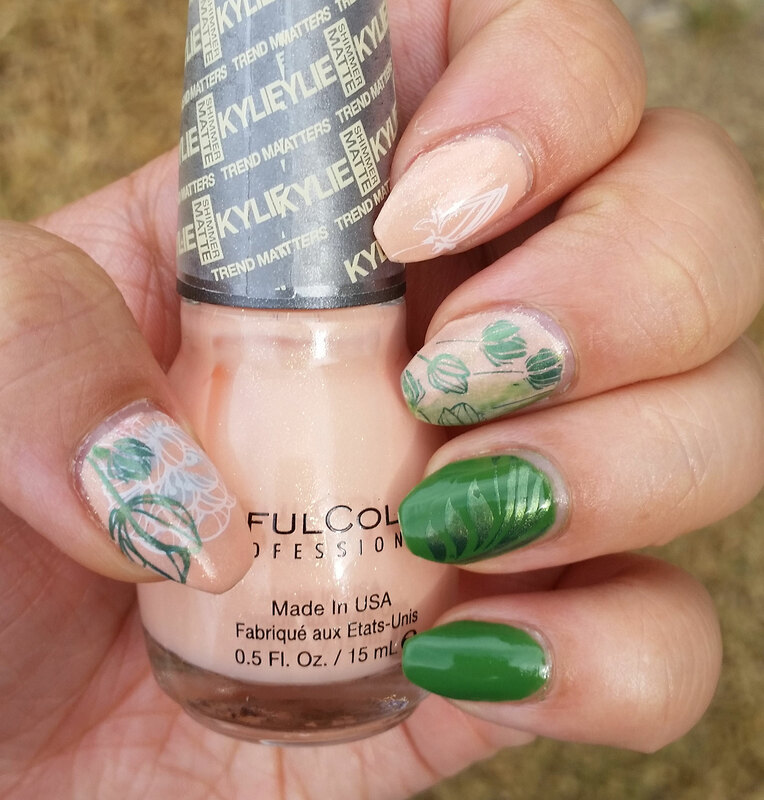 Loved this manicure and probably kept it on my nails for far too long because I’m behind on the ABC nail art challenge again.